After the extent of the surveillance operations carried out by government organization like the NSA was revealed by Edward Snowden, privacy has been a critical concern for internet users. As a result, the popularity of VPN services has increased significantly and there’s no shortage of options to choose from. ZorroVPN is one of the solutions available and since 2012, the provider has been working to help users around the world to enjoy security and privacy when they are online. ZorroVPN promises anonymity on internet and all its features are focused on fulfilling that promise. In this review of ZorroVPN, we’ll explore the features that the provider offers to protect the privacy and online freedom of its customers. In order to achieve its goal of being an effective solution to help users to mask their online identity, ZorroVPN offers strong encryption and the most secure protocol available. OpenVPN with AES-bit encryption and 4096-bit RSA authentication keys are available to defend your connection from eavesdroppers, online surveillance and anything that could compromise your privacy. Additionally, ZorroVPN offers a feature called VPN Chains. When you use VPN Chains, your encrypted traffic is routed through a first server, then through a second one, a third one and even a 4th one. This brings security to the next level and increases your chances of being truly anonymous on internet. Setting up your connection with up to 4th servers in a chain is only one of the options that ZorroVPN supports to protect your internet traffic. The VPN + Tor functionality, allows you to forward your traffic from VPN to the Tor anonymity network. With the VPN +Tor function, Tor browser is switched on and a VPN server is set to be a constant entry node that ensures that your ISP can’t see that Tor is being used. You will be able to visit .onion sites and hidden services securely and with enhanced anonymity. When you combine this solution with VPN chains, you can protect your identity and the privacy of your online activities from malicious hackers and eavesdroppers. They won’t be able to see what you are up to when you are connected to internet and won’t find any trace that leads back to you. The advanced security features that ZorroVPN supports make it a good alternative for users who need to protect their identity online. This is crucial for those who live under oppressive regimes, where internet is heavily restricted. The high level of encryption, the Tor support and the VPN chains feature are already strong evidence of the ZorroVPN’s commitment to privacy and anonymity, but there is more. To top it all, the provider offers a no logs policy, that confirms its position as a good solution for users who are concerned about privacy. Additionally, Bitcoin is accepted as method of payment and there is a cryptographically signed Warrant Canary to update customers regularly and alert them in case backdoors are detected and censorship is imposed by authorities at any stage. The fact that ZorroVPN is based in Seychelles means that it is away from the jurisdiction of the NSA or the GCHQ, two agencies known as privacy’s biggest enemies. ZorroVPN is compatible with multiple platforms including Windows, Linux, macOS, Android, iOS. The service can also be used on routers running DD-WRT or Tomato firmware and once you sign up for the service, you will be able to access detailed instructions to set up ZorroVPN. 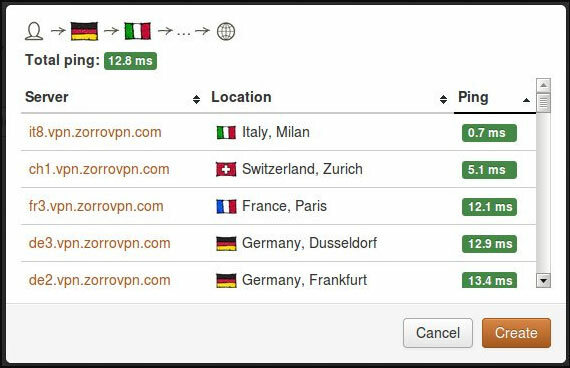 Although there is no custom VPN client at the moment, ZorroVPN supports dynamic configuration file generator, which allows you to configure your .ovpn files (selecting settings like protocols, ports and more) before downloading them, simplifying the set up process. If you need assistance installing and running the VPN, you can reach out to their support team. They even offer remote assistance in this case. Server selection is clear and easy to use, with an automatic ranking of servers based on fastest ping response time. This takes the guessing work out of choosing the fastest possible servers for your selected region. The server address is also clearly displayed. These addresses are helpful when setting up email addresses that need to whitelist VPN URLs, in order to avoid IP security checks when logging in. Port forwarding is available so you can set up rules to direct traffic on an external port to a port on an internal IP address. You can also change your IP address on-the-fly, without interrupting your connection. This gives you more flexibility when you are connected to internet and wish to ensure that no one can trace you. ZorroVPN offers unlimited bandwidth and the provider has its own DNS servers. You can enjoy optimal speeds without limitations. P2P is allowed in servers located in Sweden, Ukraine, Netherlands and Russia. Up to three simultaneous connections are supported. 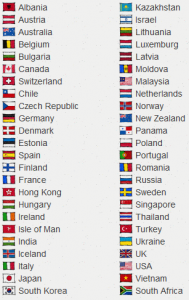 Currently, ZorroVPN has servers in 48 countries including Australia, Bulgaria, Canada, Czech Republic, Germany, Denmark, Estonia, Spain, Finland, Hong Kong, Hungary, Ireland, Iceland, Japan, South Korea, Kazakhstan, Israel, Lithuania, Netherlands, Norway, Romania, Russia, Sweden, Thailand, Ukraine, United Kingdom, United States and Vietnam. New servers are regularly added and you can suggest specific locations. ZorroVPN does a good job at keeping its network updated to suit their customers’ demands. There is one plan called Master and the price depends on the length of the subscription. One month costs $15, two months cost $25, for three months you pay $36 and for six months, $68. One full year of ZorroVPN costs $120 and it offers the largest discount in the long term since the monthly price is reduced to $10. While the service is more expensive than other options available, it should be noted that ZorroVPN offers a very strong level of security and privacy protection. If you are paranoid about online surveillance and large corporations tracing your steps, it is an investment worth considering. They offer a 7-day money back guarantee so you can request a refund in case the service is not suitable for you. ZorroVPN offers practical information about the features and main aspects of the service on its website. You can also contact them via Skype, ICQ, Twitter and email. If you need help with the installation and configuration of the service, remote assistance can be requested. Email requests are prioritized and responded within a few hours. We like to see that they also offer a secure email option that ensures that your communications with them also remain private. ZorroVPN is an impressive service that takes privacy very seriously, paying attention to every detail in order to provide the highest level of protection. They offer a great selection of features to help to maintain your anonymity and their service will also help you to defeat censorship and online restrictions. You can stream or download content, use VoIP services or browse without compromising your personal information. Although the prices are high when compared to other services, if privacy is a priority for you, it is definitely an option that deserves a try.